Welcome to the Black Forest! 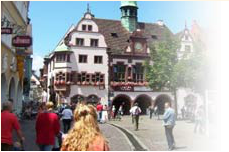 Visit Ferien-Urlaub-Schwarzwald.de and experience an exciting holiday and vacation trip through the Black Forest. This site offers an extensive selection of hotels and boarding houses as well as holiday apartments and cottages throughout the Black Forest region. We wish you a pleasant stay and lots of fun visiting Ferien-Urlaub-Schwarzwald.de. There is no other region in Germany which possesses the variety of the Black Forest, a 160 km long area in the south of the Black Forest in Germany, divided into the north, middle and south, bordering on France and Switzerland. The landscape is full of natural beauty in the form of forests, meadows, streams, rivers, crystal-clear lakes and mountains. The best-known and highest are Belchen and Feldberg in the south of the Black Forest. In middle of the Black Forest many rivers have their source, among others the Brigach and the Breg which flow into the Danube. Around the lakes Titisee, Feldsee, and Feldsee there are many hotels, holiday flats, boarding houses, camp-sites and bed and breakfast places, both in private houses and small hotels. Whether you want to spend your time there as a family or single person, enjoy a “wellness” holiday or be more active, as a pensioner or even handicapped, the Black Forest has something to offer for all these groups. In the summer the water in the lakes is warm enough to bathe in, and in the winter there is often enough snow to ski both cross-country or Alpine. The Black Forest has the most rainfall but the temperature is usually very pleasant and in the summer there is always plenty of sunshine. If you want to enjoy history and culture the Black Forest has a lot to offer. You can visit he mine in Münstertal, which produced iron ore, silver and cobalt. Near Todtnau you can watch glassblowers at work and even join in! The most interesting and unforgettable experience is to watch how the traditional Cuckoo Clocks are made and assembled. The old town Gegenbach and the small towns Schiltach and Haslach are also well worth seeing with their historical buildings and half-timbered, black and white houses and the Museums with traditional costumes and clocks. In the many monasteries it is more peaceful. The most important are the Benedictines in St. Trudpert, St. Blasien, St. Peter and St. Märgen. The open-air museum Vogtbauernhof shows life as it was in the past. There are also opportunities for doing sports. The Titisee and Schluchsee offer different water sports like diving, surfing and swimming. There are extra beaches for children, which contain shallow water so that the whole family can spend their holidays at the Black Forest. Another alternative is walking on the 300 km long hiking trails. These draw through the whole Black Forest and present different degrees of difficulty. Some of these hiking trails are the Barfußwanderweg, the Uhrenwanderweg, the Hansjakobweg and the Wutachweg. In the winter you can go skiing in Todtnau and Hinterzarten. There you can choose between different ski runs and Hinterzarten is a stronghold for ski-jumping. In the south of Black Forest you can use the hot springs of Bad Bellingen, Bad Kozingen and Bad Liebenzell. For overnight stay you can choose between hotels, holiday flat and farms. Most mentionable is the only „Wisent-Rinderlehrpfad“of Europe in Gersbach. If you would like to join the night life of the Black forest, there are many options. In Freiburg and Karlsruhe there are student bars, discos and festivities. In Baden-Baden you can visit one of the oldest gaming houses of Germany. For those who are searching for thrill, the Europapark Rust can be visited. We wish you a restorative holiday in the Black Forest!